Remember the days when the thought of an airport layover brought shudders and a sense of dread? Today’s airports are breaking out of that mold—and breaking all the old rules—to offer bespoke services to modern travelers. From luxury lounges, modern spas and art museums to wine bars, gourmet restaurants and markets filled with fresh produce, airports around the world are revolutionizing the travel experience. Discover a new place each month for your next luxe layover. San Francisco International Airport (SFO) started out 85 years ago as a dirt strip in a cow pasture. 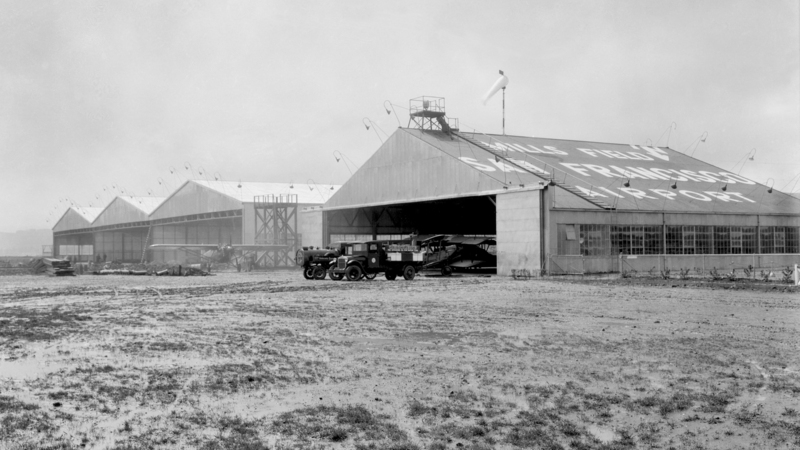 The city leased 150 acres of land in 1927 for three years (at a cost of $1500/year) to test the waters and see if an airport would be popular. During its first month of operation, 19 passengers flew into the new airport. The first commercial airline at the new airport was Boeing Air Transport, which became part of the new United Airlines in 1934, along with National Air Transport, Pacific Air Transport and Varney Air Lines. SFO remains one of United’s largest hubs. Today, the “Gateway to the Pacific” hosts more than 45 million passengers every year on 59 domestic and international airlines with more than 3,600 flights every week, flying to more than 65 US cities and 32 international locations. 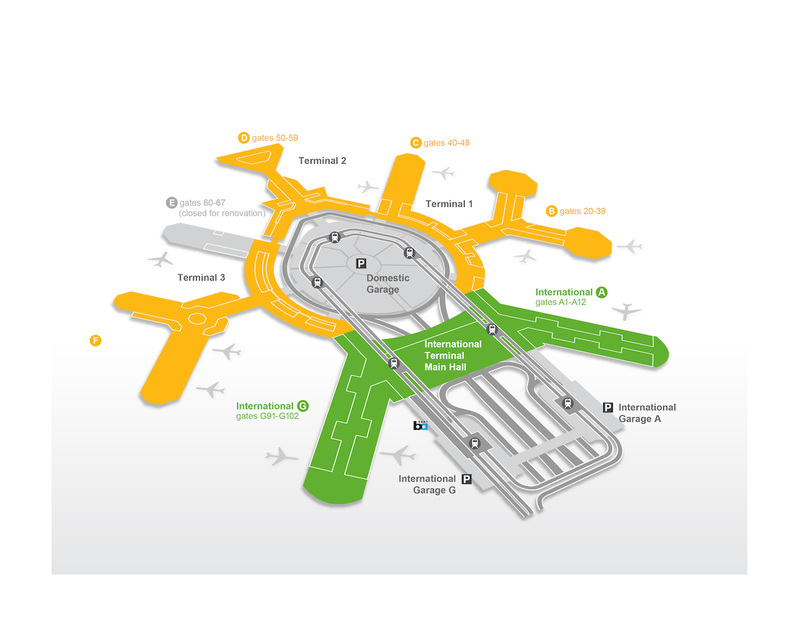 There are now three regular terminals (1 through 3) and an international terminal at SFO. Terminal 1 serves AirTran, Delta, Frontier, Southwest and US Airways (subject to change due to the merger with American Airlines). Terminal 2 is home to American and Virgin America. Terminal 3 is the home of United (domestic flights). There are 32 international airlines, including United’s international flights, using the International Terminal. 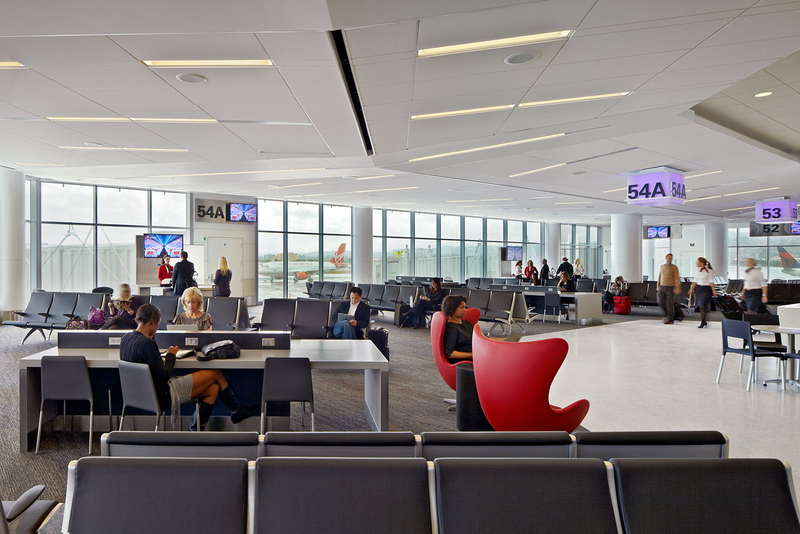 SFO has recently updated Terminal 3 with a $138 million renovation, creating one of the world’s most updated boarding areas. Used for United flights, the T3 boarding area houses 10 gates with neighborhood restaurants, children’s play areas, lounge furniture, ambient floor lighting, WiFi, ample electrical outlets, lighting that aligns with our circadian rhythms, plenty of natural light and a yoga room with a Zen relaxation quality. The AirTrain operates 24 hours and connects you to all of the terminals as well as the BART station, which can whisk you downtown in about 15 minutes, making it an ideal way to see the city during an extra long layover. Air France-KLM Lounge is inside security in the International Terminal. It is open from 8 am to 4:30 pm daily and offers free WiFi, computers, TVs, restrooms and reading material. American Airlines Admirals Club is inside security in Terminal 2. The Admirals Club is open from 4:30 am to midnight daily with conference rooms, PCs, free WiFi, showers and food for purchase. Passengers on any airline may purchase a day pass to use the Admirals Club. British Airways Terraces Lounge is after security in the International Terminal. The lounge opens at noon and remains open until the last departure of the day. Cathay Pacific First and Business Class Lounge is after security in the International Terminal. The lounge opens four hours prior to flight departure. This luxurious lounge has a buffet and noodle bar, reading material, computer workstations, restrooms, phones, TVs, a business center, free WiFi and showers. China Airlines Dynasty Lounge is after security in the International Terminal. The lounge is open daily from 9:30 pm to 1:30 am during the summer months and from 8 pm to midnight in winter. The lounge has a luggage storage room, restrooms, PCs, buffet, snacks, beverages and reading materials. Delta Sky Club Lounge is before security in Terminal 1, on the Mezzanine level above the ticket counters. The lounge offers free WiFi and is open 5 am to midnight. Emirates Lounge is after security in Boarding Area A of the International Terminal. If you’re flying First or Business Class or as an Emirates Skywards Platinum or Gold member, you can enjoy this luxurious lounge. There is a full bar, large buffet with breakfast items early, followed by a selection of Arabic, Far Eastern, Western and Vegetarian cuisine along with desserts. There is comfortable seating, TVs, international magazines and papers, showers, business center with PCs and free WiFi. EVA Air Evergreen Lounge is after security in Boarding Area G of the International Terminal. The lounge has TVs, reading material and free WiFi. Japan Airlines Sakura Lounge is through security in Boarding Area A of the International Terminal. The lounge is open from three hours to 30 minutes prior to departure. The lounge offers free WiFi, TVs, food and beverage. Philippine Airlines Mabuhay Lounge is past security in Boarding Area A of the International Terminal. Singapore Airlines SilverKris Lounge is inside security in Boarding Area G of the International Terminal. This luxurious “home away from home” is open from 10:30 am to 1:30 pm and 9:30 pm to 12:45 am in summer and from 9:30 am to 12:30 pm and 8:35 pm to 11:45 pm in winter. Travelers can enjoy a selection of warm food, light snacks and beverages, free WiFi, PCs, showers, restrooms and TVs. United Arrivals by United is on the baggage claim level in Terminal 3 and open 8:30 am to 12:30 pm. The arrivals lounge, with showers, is open to United Global First and Business First customers. United Global First Lounge is open to United Global First customers. It is inside security in the International Terminal and open from 8 am to 10:30 pm. United Club on the Mezzanine Level is inside security in Terminal 3. The lounge is open from 5 am to 11:30 pm daily and has premium wine and spirits available. United Club in Terminal 3, Concourse F in the Rotunda, is open from 5 am to 11:30 pm daily. There is a conference room and you can purchase premium wine and spirits. United Club is inside security in the International Terminal. It is open 5 am to 11:30 pm daily. Virgin Atlantic Clubhouse Lounge is before security in the International Terminal. The chic lounge is filled with local art, changing lighting, showers and restrooms. The club serves free beverages and free food, from light snacks to full meals. 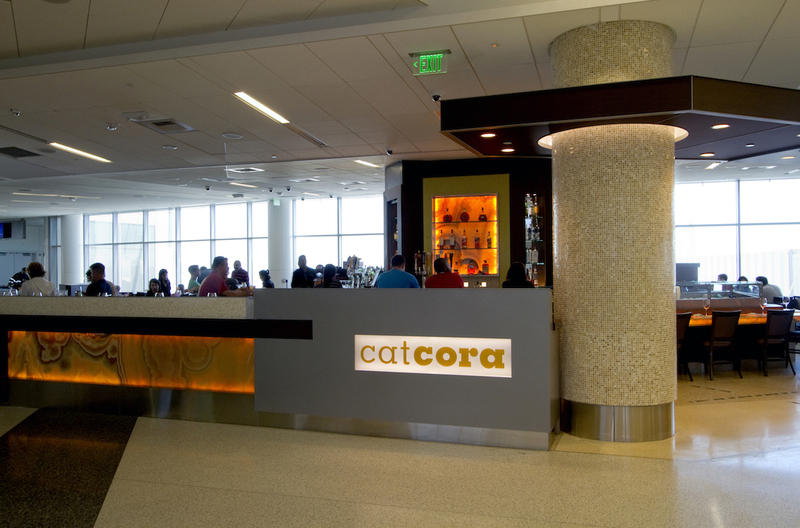 SFO has a large number of restaurants in each terminal. While you can find plenty of chains, coffee shops, places for grab-and-go food, you will also see a great offering of locally owned sit-down restaurants, serving up the same great food you can find throughout San Francisco. As in most of San Francisco (and due in part to the large number of Asian travelers flying through SFO), there are a number of very fine Asian restaurants, serving up fresh sushi, sashimi and noodle dishes. Here are some of the best dining experiences in each terminal. 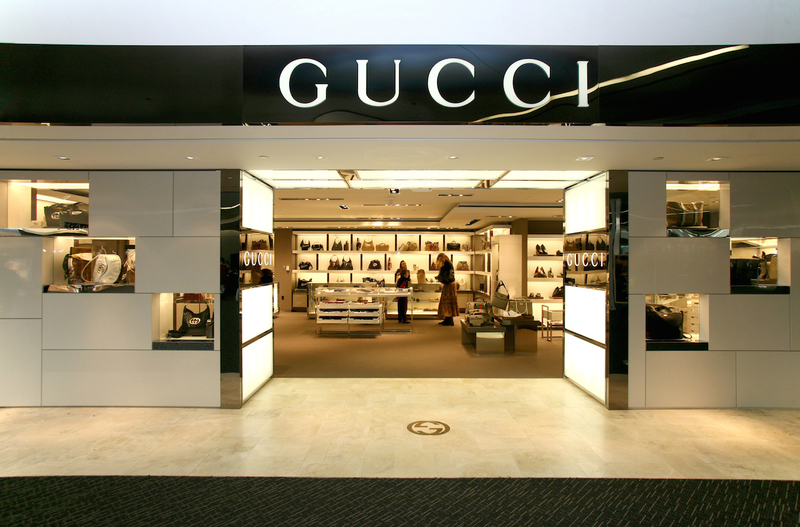 Shopping at SFO will keep you busy during a long layover. For something local, check out Bouclé in Terminal 3 near gate 82. If you love unique jewelry and watches, be sure to sneak a peek at the creations in Bouclé, everything by local artists and designers. 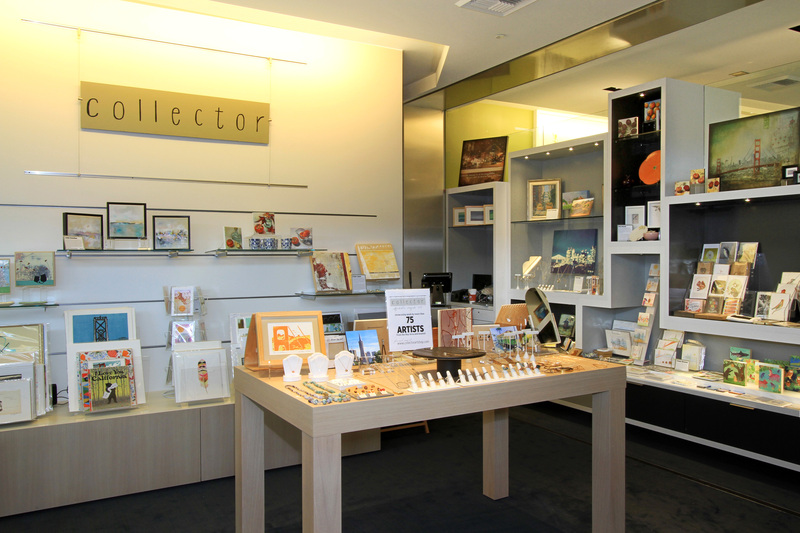 Another great gallery featuring the work of local San Francisco artists is Collector, also in Terminal 3, Boarding Area E near Gate 69. 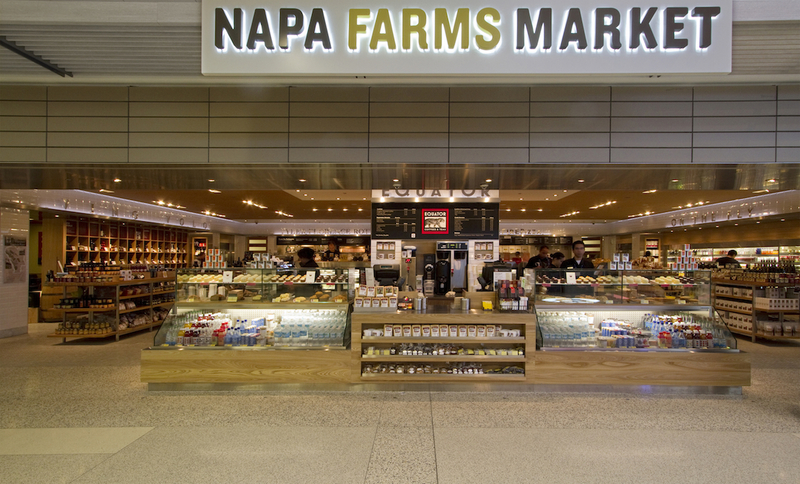 If you want to take home some of that great California wine, head to California Lifestyle in Terminal 3, Boarding Area F at the entrance to Gates 80 through 90. 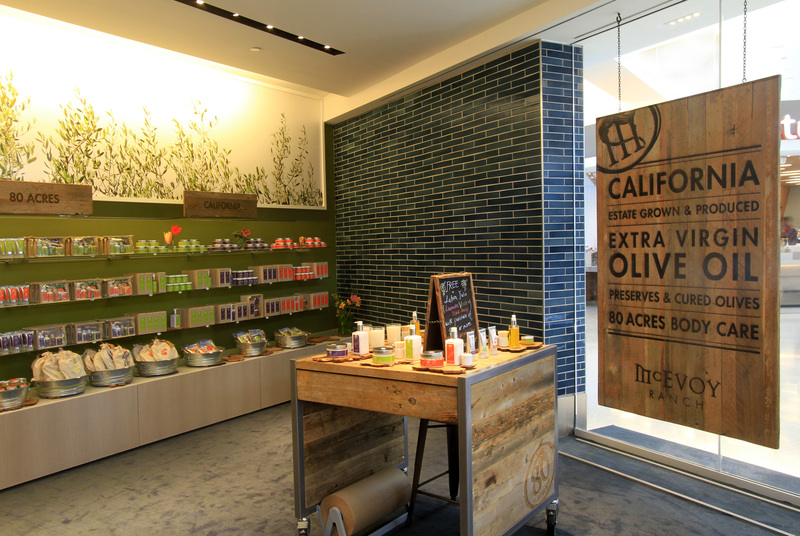 For more locally sourced food items, you can check out local olive oils (both for cooking and skin care) at McEvoy Ranch in Terminal 3, Boarding Area E near Gate 69. 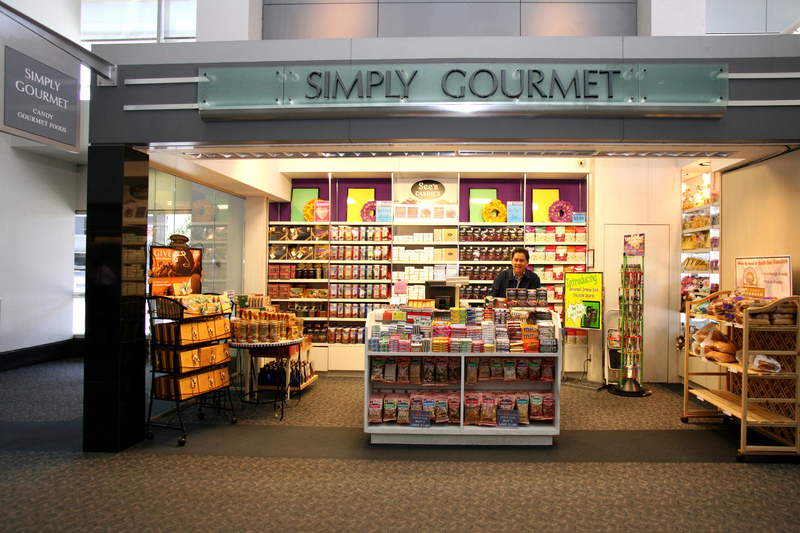 For an assortment of other local gourmet foods, candies and gifts, stop by Simply Gourmet in Terminal 1, Boarding Area C. Of course, you can’t leave San Francisco without stopping by Ghirardelli in Terminal 3, Boarding Area F, to get some of local premium chocolates. For something a little different, check out Destination Green in Terminal 3, Boarding Area F near Gate 82. The store sells a selection of earth-friendly gifts from companies committed to sustainable design. Terminal 2 is home to Kiehl’s, known for high quality skin and hair care products. A joint effort between the SFO Museum and the San Francisco Arts Commission makes SFO a fabulous art gallery in addition to being a busy international airport. SFO Museum keeps a series of changing exhibits throughout the airport. 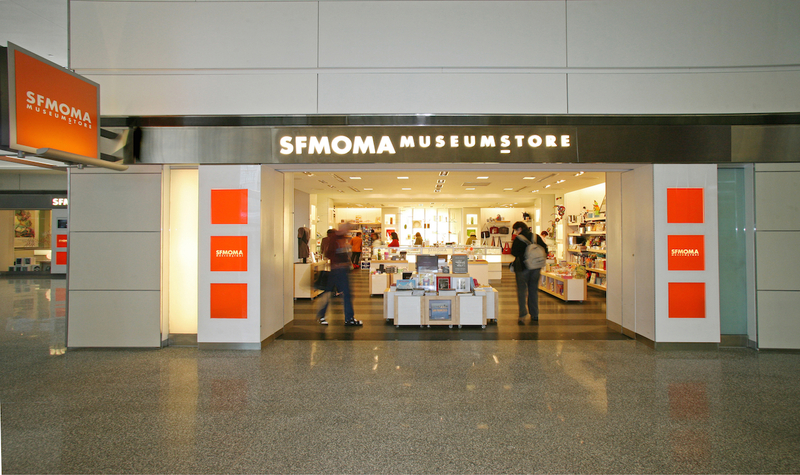 You can find a listing of current displays online at http://www.flysfo.com/museum/exhibitions. The San Francisco Arts Commission provides the airport with a fabulous public art program. From paintings and mosaics to sculptures, you can find more than 80 pieces on display. In Terminal 2, be sure to check out Janet Echelman’s ceiling installation entitled Every Beating Second. This fabulous public art map shows all the public art currently on display at SFO. Finally, visit the Louis A. Turpen Aviation Museum in the International Terminal, for a look back at the golden age of air travel. This museum, free to the public, is designed to resemble SFO’s passenger lobby from the 1930s. 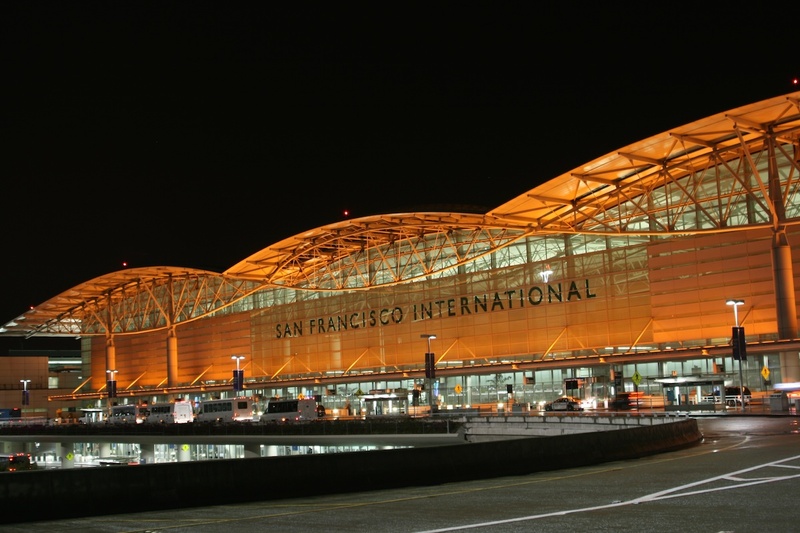 San Francisco International Airport—SFO—is often the first airport you visit in the US after a long overseas flight, or the last airport you visit before embarking on a long overseas flight. Because of the extended traveling time, it’s a good idea to stay active or to find time to reflect and meditate. SFO makes that easy with several amenities designed for traveler comfort. If you need some quiet time to reflect or meditate, you can stop by the Berman Reflection Room, located before security in the International Terminal. The meditation room is free to travelers and open 7 am to 11 pm. If you prefer a bit more activity, you can check out the world’s first yoga room at an airport. The Yoga Room is free to the public and open 24 hours in two locations at SFO. There is one in Terminal 3 and another in the new connector between Terminal 2 and Boarding Area C in Terminal 1. If your idea of relaxation involves a spa, you’re in luck with the four XpresSpa locations at SFO. Stop in for a manicure, pedicure, massage or facial. There is one in Terminal 2 and two in Terminal 3 that are open 6 am to 11 pm. There is also one in the International Terminal, open 7 am to 11 pm. If you want to stretch and get some exercise while learning a bit more about the airport, check out the self-guided tours created for each of the four terminals. Designed to last about 30 minutes each, some of the tours even have you stepping onto the AirTrain for a quick trip around the airport—a huge hit with the youngest travelers. You can click here to view the detailed itineraries online (look for Self-Guided Tours), download a short version of the map or check out the iPad Kiosks at the Information Desk in each terminal. Kids who complete the tour can return to the Information Desk afterwards (anytime between 8 am and 8 pm daily) to claim a special prize. One of the most unique, newest and most fun things to do at SFO is to find one of the dogs in the Wag Brigade. SFO wants to see happy passengers, so they started a program that brings trained dogs into the terminal to help make your airport layover more fun. The San Francisco Society for the Prevention of Cruelty of Animals brings in dogs certified through the Animal Assisted Therapy Program to wag and wiggle and nuzzle their way into your heart.